For this reason there is no such thing as a 'standard consumer unit' - but while the number of sizes, makes, brands and combinations of configurations is almost infinite there are in fact only four main types of consumer unit. Used in conjunction with the circuit protection devices - (RCD, RCBO & MCB) - these four types of consumer unit offer the homeowner and electrician huge flexibility of circuit design and budget. It is important to understand that in most domestic properties it would be possible to use any one of the four types of consumer unit, the decision being governed by budget and attitude to circuit separation. Isolates the entire consumer unit and all devices. Turning this switch to 'OFF' will cut power to all circuits that are terminated in the consumer unit - which is usually all circuits in the house. Nearly all consumer units are supplied with a 100a main switch. Protects a bank of circuits from earth leakage or 'Residual Current' - for example - cutting through the lawnmower cable. Protecting a bank of MCBs means that earth leakage on one circuit will cut power to all other circuits protected by that RCD and is considered a form of 'nuisance tripping'. The most common domestic RCD is rated at 80Amp 30mA. Click here if you want to know more about RCDs. Protects cables and devices from overload and consequently fire. Under the latest '17th Edition Wiring Regulations', all MCBs must be used in conjunction with an RCD in order that the circuit is also protected against earth leakage. MCBs are commonly available in the following amperages: 6a, 10a, 16a, 20a, 32a and 40a. Click here if you want to know more about MCBs. A special device which combines the functionality of both and RCD and MCB, protecting against both overload and earth leakage. This offers complete circuit separation negating nuisance tripping. RCBOs are more expensive than MCBs. A 'Main Switch Consumer Unit' is so called because it is supplied empty of all protection devices except the main switch. Whilst it may be populated with an RCD and MCBs. 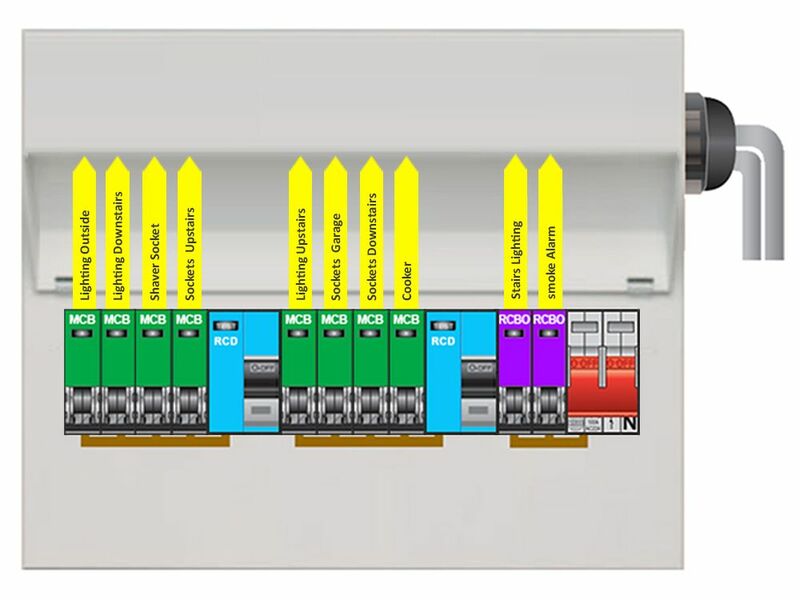 It is usually populated exclusively with RCBOs as shown in our image, but theoretically could be populate with RCD and MCBs. Many electricians consider this the best circuit protection solution as each circuit is protected from overload and earth leakage individually, thus preventing nuisance tripping caused by earth leakage on other circuits. 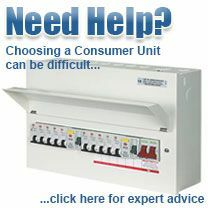 A 'Dual RCD Consumer Unit' is supplied with the main switch and two RCDs and offers a cheaper solution. Our image shows a typical installation with the two banks of MCBs protected from earth leakage by the RCDs. Consideration must be given to circuit design in this scenario. You should not, for example put all the lighting circuits on the same RCD as an earth leakage fault on one of those circuits will cut power to the whole bank, leaving you without any lighting. Despite the limitations of dual RCD consumer units, they remain extremely popular due to the cost. Indeed, most 'fully loaded' consumer units are dual RCD configuration. 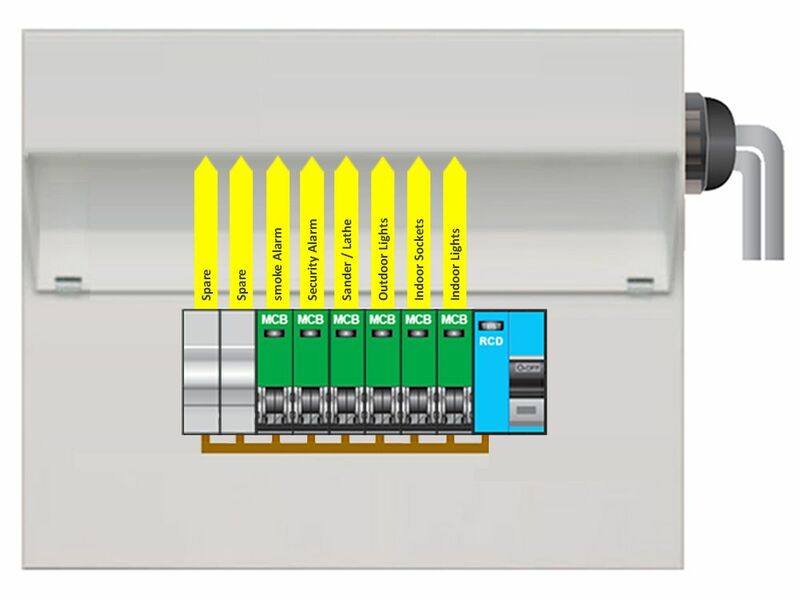 Allowing for the use of RCBOs and two banks of MCBs they offer total circuit separation for critical circuits and highly cost effective protection for standard circuits. High Integrity consumer units are becoming increasingly popular with electricians - because they make circuit design easy - and homeowners - because they offer excellent protection without breaking the bank. They are particularly good in projects requiring 12 or more circuits. 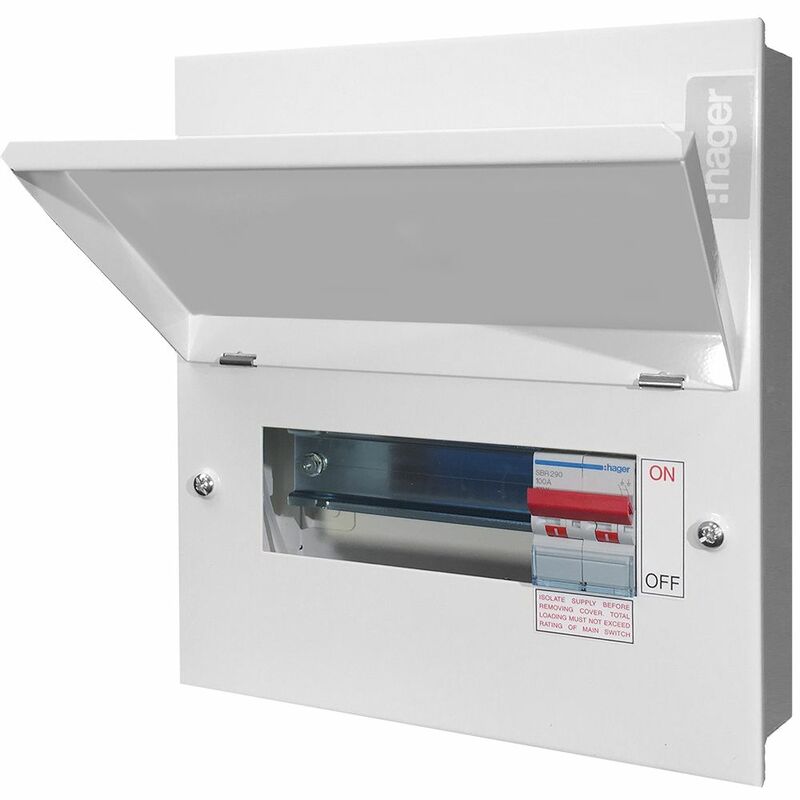 An 'RCD Incomer' consumer unit is a special type of protection device, generally used in workshops, garages, garden offices and sheds which use small numbers of circuits. The defining difference between this and other types of consumer unit is the fact that it does not have a 'Main Switch'. Isolation of the board is handled by the single RCD. In other words, all incoming electricity is managed by the RCD - hence the name. This type of consumer unit offers no circuit separation as it may only be populated with MCBs. Earth leakage on every circuit in the arrangement is dealt with by the one RCD. That means that a residual current fault on any circuit will knock out power to all other circuits. For this reason they are almost never used in the main dwelling. The most common enclosure is the standard surface mounted, metal, 'Amendment 3', enclosure. 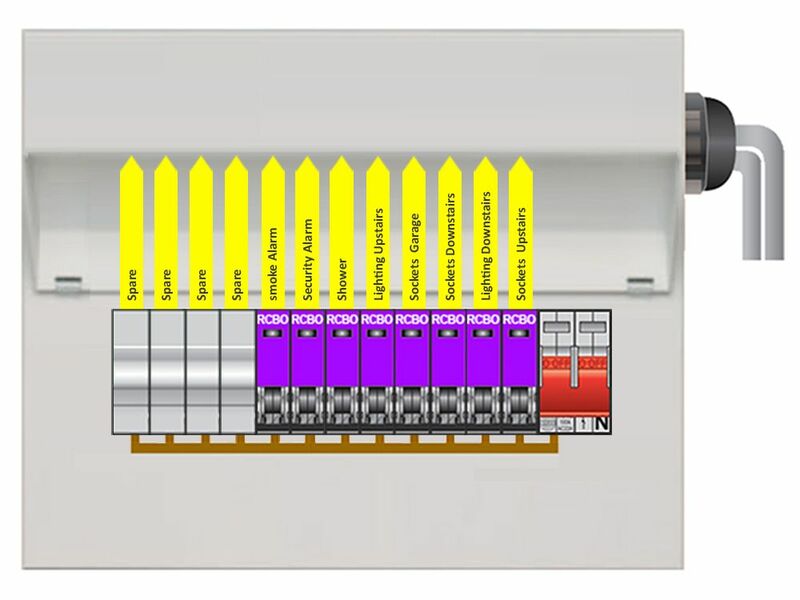 All four types of consumer unit are most commonly supplied in this format. They usually always feature a front lid hinged at the top, so that it closes through gravity when not being worked on, thus ensuring it is always closed. Width is dependent on number of circuits, but they are usually about 240mm high and 80mm deep. ..is one in which the circuits are arranged over two rows. It is important to note that this does not necessarily mean the unit offers two banks of circuits. Whilst most Duplex consumer units are 'High Integrity' or 'Dual RCD' some are just 'Main Switch' - which offers no circuit separation unless it is fully populated with RCBOs. ..is one which is recessed into the wall. 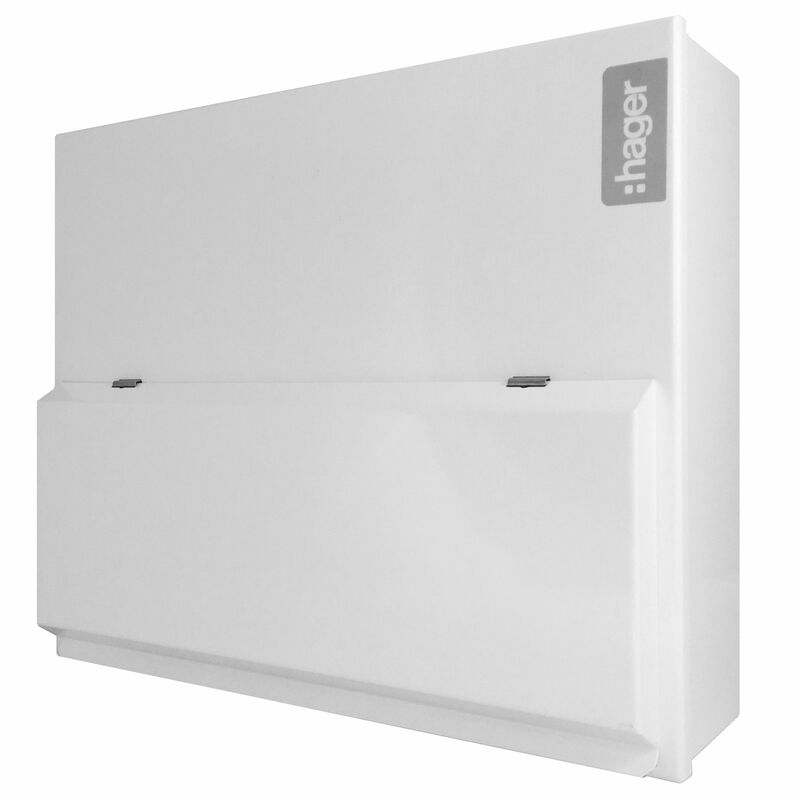 All four main consumer unit types are available in flush versions. They are functionally the same as a standard amendment 3 enclosure but are aesthetically better with a very slim profile. 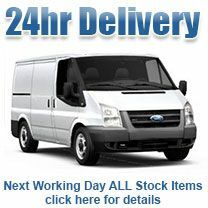 ..is simply a trade term given to any consumer unit below four way - but usually just two ways - commonly used in outhouses, sheds and ...garages, where a couple of circuits maybe required for lighting and tools.